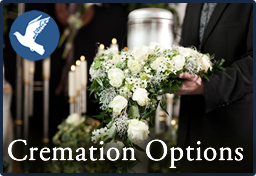 Roller Funeral Homes' Cremation Services offer a variety of options and packages for your family during your time of grief. Cremation is an option, which allows for great flexibility in style of service, time of service, price and preference for final resting place. Our helpful staff can assist you in selecting the service that is most appropriate for your family. No matter which type of service is selected, we can help you give your loved one a special, dignified and personalized tribute. This service option is offered for celebration of life events, religious ceremonies, or anything in between. A celebration service can include a wake, visitation and/or ceremony at the funeral home, place of worship or other venue followed by cremation. We can discuss with you the many options available for your family. We also offer our families a Tribute DVD set to music. A Celebration Service may be elaborate or simple. Flowers, pictures, and memorabilia are displayed. A register book, thank you cards and memorial folders are also available. A memorial service is one that can take place anytime even weeks after a cremation. This allows time for loved ones to gather if they live far away. Roller Funeral Homes believes a memorial service is good to have as soon as possible to allow mourners to process their grief. However, it may take place weeks after the death. A memorial service is similar to a funeral service; however, the body is not present. Photos, mementos and other memorabilia may be brought in to personalize the memorial service. Register books, memorial folders, thank you cards and a Tribute DVD set to music can be made available. We can discuss with you the many options for you and your family.